Irakli Kakabadze was the writer-in-residence at the Ithaca City of Asylum for the past two years. 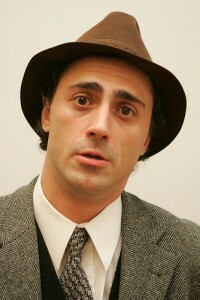 Hailing from the Caucasus nation of Georgia, Kakabadze suffered persecution at the hands of the government because of the opinions he expressed through his writings and protesting. We corresponded with Kakabadze via email to see what project he is currently working on and to learn about his experiences with City of Asylum. What was your experience like in Ithaca? We have had a wonderful experience in Ithaca, NY for the last 2 years. We appreciate the work of Ithaca City of Asylum. This is a wonderful organization that has assisted our family in settling and working in Ithaca, New York. At the same time, I have had wonderful teaching opportunities at Cornell University, as well as Hobart and William Smith Colleges. I have taught my passion: Peace Building and Creative Arts class. This is the method, where readers and spectators are able to change the play, make a difference. I was very glad to work with wonderful students who were quite bright. They have shown a great deal of creative thinking, based upon good readings, in the emerging field of peace building and conflict resolution. So, this experience of working with students on peace building through arts has been very valuable to me. I intend to continue working with different universities and communities on these projects. How were you involved with the Jazz Poetry Concert and what did this event mean for you? This event in Pittsburgh was truly one of the most amazing events that I have ever participated in. Thanks to City of Asylum/Pittsburgh, writers were able to demonstrate their best abilities in collaboration with great musicians. There was a great synergy between international creative writers and great American Musical tradition. Performing with Oliver Lake, Reggie Workman, Geri Allen, Andrew Cyrille was a great honor. But at the same time, the way that City of Asylum/Pittsburgh conceived this idea is very innovative; doing it in the middle of the urban community is making a great statement that our world is becoming smaller and we do understand each other more. I was very happy to see that City of Asylum/Pittsburgh is creating great conditions for creative collaboration between artists from different parts of the world. Remembering the words of Jacques Derrida during the founding of International Cities of Asylum, “hospitality is one of the most important traits of our contemporary world” and Pittsburgh, together with Ithaca, is showing a good example of this hospitality. Why do organizations like City of Asylum are important for writers under the threat of persecution? I think it is extremely important to have cities of asylum in today’s world of postmodern dictatorships. Many writers and creative people are facing a very uncertain future in those places. I think that the creation of cities of asylum in Europe and America is a very important step towards overcoming a disease of contemporary nation-statism. Visions of Cities of Asylum brings us closer to the ideal of world citizenship. Of course this is a very challenging and difficult road, but I believe this a right path to pursue. I think that both ICORN in Europe and North American Cities of Asylum Network are doing a great job of keeping freedom of expression alive. City of Asylum makes it possible for writers to continue working. What is the latest writing project you are working on? As I have said, my latest work is working with Polyphonic Discourse in multiple ways, using art as a vehicle for social change in different communities and as a tool for peace building reconciliation. I believe in the transformative power of creative arts. The world in 21st century is a polyphonic world, where there are multiple voices to be heard and arts need to be part of this transformation. I am very excited about our time where we have endless possibilities for change and many different challenges. Click here to read Brian’s bio.